Beautiful fruiting cranberry plants that you can use to make home grown, homemade cranberry sauce! With these plants you'll be able to pick your own cranberries and make sauce from these on Christmas Day! Perfect for a special and unusual present for friends and family or any gardener! 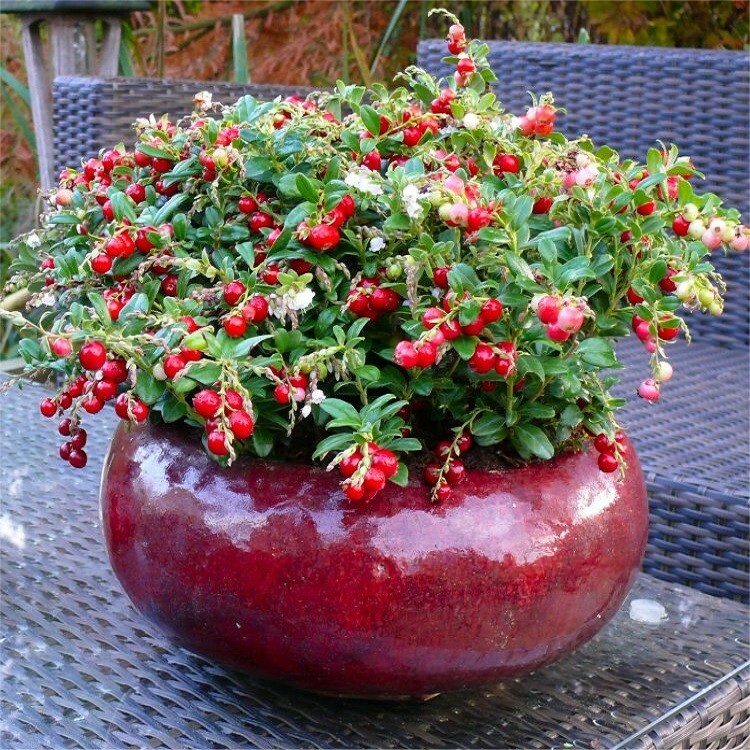 Vaccinium "Red-Candy" is a small berried form of the somewhat more familiar larger berried cultivated north American cranberries, just like you might buy in the supermarkets. Those have bigger, but more tart flavoured berries. This gem although small fruited carries many more, and we find them much tastier than the traditional type when prepared in the usual way and made in to the sauce that is today as much an essential part of the traditional Christmas lunch as the turkey itself. Another benefit is that they are also thinner skinned, which makes for a much pleasanter sauce. They're that good, you can even make them in to other preserves, such a jam, or for unusual sauces to go with other deserts and even ice cream! Cut down on the sugar you use to get a real fruity flavour, or increase if you like things that little sweeter. 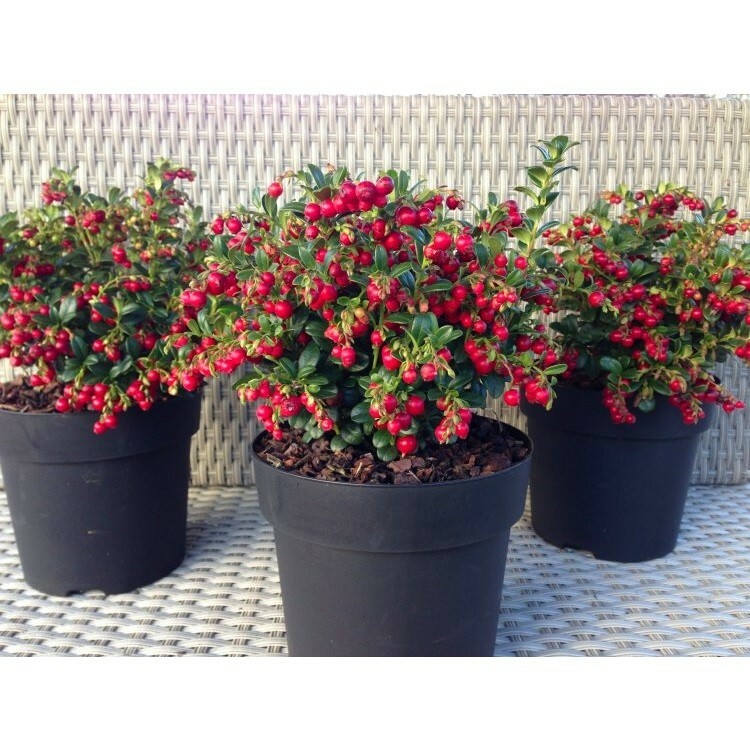 Clusters of pink-flushed white flowers are followed by the shiny red berries, these have the familiar tart flavour, They appear on a low-growing, evergreen shrub, which will slowly spread to form a generous, leafy clump. Originating from the Arctic and alpine regions of Northern Europe and North America, this plant is incredibly tough and robust. The flavour of homegrown cranberries is exquisite when made into sauces and preserves. These plants are lovely bushy young specimens, supplied in approx 9cm pots and covered in berries in season. They are ideal for patio containers or ground cover in a damp spot, and thrive in soil with plenty of compost, leaf mould or organic matter included. Why not plant in your very own in the garden and have a reliable supply of the freshest, flavoursome, juicy cranberries every year?